Pizza dough (a little bigger than a baseball for a 12 inch pizza). 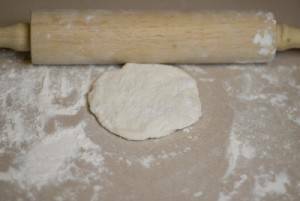 Most grocery stores carry pre-made pizza dough, look for it in the bakery department. 2 tablespoons of pizza sauce (sauce in the jar is just fine, on the pasta isle of your grocery store). 1 handful of mozzarella cheese (add other cheeses if you want!). A few tablespoons of all purpose flour so things don't stick. Cookie sheet (with no sides). Brush for your olive oil. 1Clean and then light your grill and set it to high heat. Spraying a little cooking spray on the grate BEFORE you light the grill never hurts. 2Sprinkle some flour on your table or counter top so the dough doesn't stick and them put the mound of dough in the middle. Keep a light dusting on flour on the dough and your hands, it will make it much easier to handle. 3Pound the dough as flat as you can with your hand and then start to roll with the rolling pin. 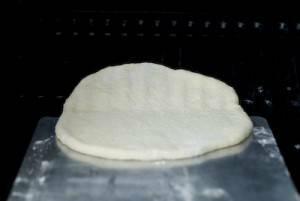 1Continue to roll the dough from the middle out and get it as flat as you liyour pizza crust. The dough will expand some when you cook it, so err on the flatter side to give it room to expand. 2Transfer your flattened dough to a cookie sheet that you have sprinkled with flower and take it out to the grill. 3Turn one of your burners down to about medium heat, but leave the others at high heat. 4Over the medium heat burner, gently slide the dough onto the burner by wiggling the cookie sheet. 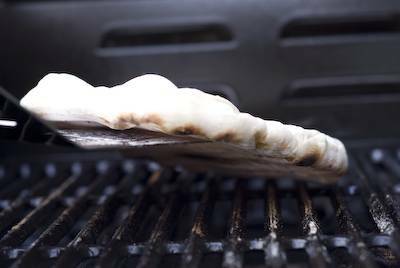 This may seem scary, but the dough quickly forms a crust and it is very easy to handle on the grill. 1Leave the lid open and observe the dough, pop any bubbles that form as it cooks to keep the air out. 2Using a spatula or tongs, monitor the underside of the dough. Some charring is fine, this adds distinct grill flavor, but when it starts to get firm you know it's close to flipping time. This step usually takes only a few minutes. 1When the dough is firm and has some char on the underside, carefully flip the dough back onto the flowered cookie sheet with the (now) grilled side up. 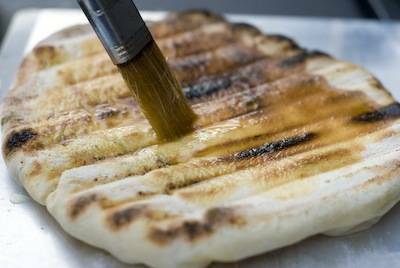 2Brush the grilled side of the dough with a little olive oil. 1Spoon the sauce onto the middle of the dough and then spread it with the back of the spoon out to the sides. 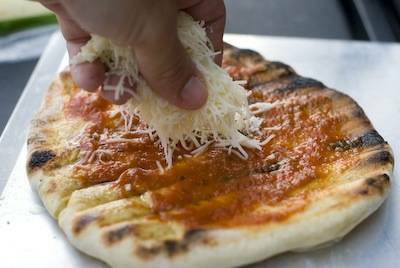 The sauce should not be too thick, too much sauce makes your cheese and toppings slide off! 2Now sprinkle your cheese over the sauce and place on your toppings. 1Now it is time to transfer the pizza back onto the grill. Just like before, carefully slide your pizza off the cookie sheet and onto the grill. 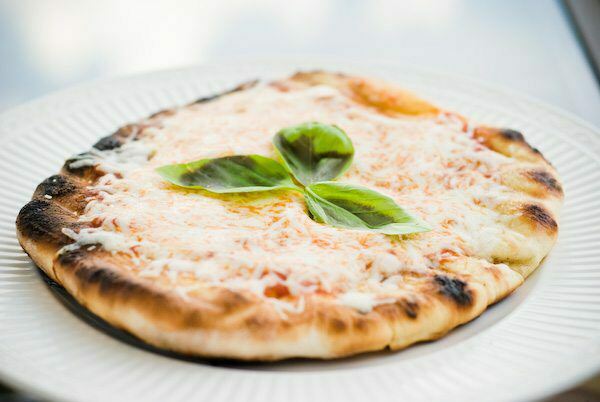 1Continue to cook your pizza until the cheese has melted and the underside of the pizza is nice and crispy! 2Transfer it to a serving plate and allow to cool for a few minutes before you slice and serve. Kids love to help build their pizza. Get them involved in rolling out the dough and then let them add their cheese and toppings. Grilling pizza makes for a great Friday evening at home with the family! PizzaQue Pizza Stones . We recently ordered one from Amazon and found ourselves making pizzas, quesadillas and flat breads for what seemed like a solid week! 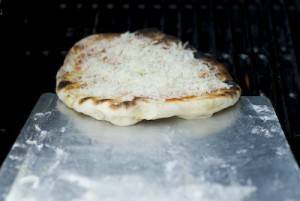 This thing is fun to use and will turn your grill into a pizza oven.